Two steampunks who took the Magic and Mysticism theme seriously. I’ve attended EVERY SINGLE ONE of the Geneva Steam conventions! Okay, that’s only three so far, and since it’s a mere hour’s drive from my home, it’s not really that much of an accomplishment. Even so, Geneva Steam is a small but growing steampunk convention, and I find I’m enjoying it more every year. The theme of this year’s Geneva Steam was “Magic and Mysticism”, which, while perhaps not tying in exactly with Steampunk, certainly is an evocative theme. A good many attendees rose to the challenge of costuming themselves to fit this idea. As always, I find the costuming at Steampunk events to be fascinating to behold. I didn’t take nearly enough pictures: as usual, I find I’m too busy staring, admiring the work put into costume design and construction to remember to get out my camera to document more than a few things. I always come away from events of this sort feeling like an idiot for not taking more pictures, and this event was no exception. Such is my lot in life. My panel discussion, “Author Q & A,” went off quite well. Always a good sign, the audience outnumbered the panelists — but only just barely. I had just enough questions to fill the time allotted and even allow for some from the audience. D. Lieber even recorded the event; you can watch it on her website HERE. Geneva Steam seems to be trying to strengthen its author track of programming, and I look forward to working with them in the future to bring in more area authors to talk about their work. I would like to thank authors D. Lieber, Dan Jager, MK Wiseman, Catherine Noble Beyer, and Geoffrey Mandragora each for being erudite and charming, making the Q&A session interesting and fun. I also want to thank Emily Schulz who was a delight to work with as author programming wrangler. As an author myself, I know too well many of the difficulties writers face, and helping others get some decent exposure — and hopefully finding them some new fans — is always worth my time. Please visit their web sites to check out their work. Lake Lawn Resort is a sprawling complex just north-west of Chicago in the town of Delavan, Wisconsin. The location is a bit out of the way, but it harkens back to the days when the wealthy and the elite would spend their summers in Wisconsin, some even going so far as to build a private rail line to bring their families and luggage from Chicago to nearby Lake Geneva. The resort has rustic decor, but fully modern and well maintained facilities, including an indoor pool, several restaurants, and during the summer fishing and boating outfitted by the resort’s own marina. The dealer’s room occupies the largest space on the second floor. The space is adequate, though an annex room had to be added to include all the vendors who wished to participate. A nice assortment of goods were on display, including jewelry (some made from authentic Roman and victorian British coins) men & women’s fashions, hats, hair falls, the occasional steampunk weapon outfitted from a Nerf gun or squirt gun, strange mechanical items salvaged from who knows where, and badges & pins. This year seemed to be the year I was destined to lose things. On Saturday I somehow popped a button cover off my purple vest. Amazingly, I found it later on the floor in front of the restaurant’s host station. On Sunday, I put in a new (to me) pair of cufflinks. They were gold metal with large red oval stones set into them, and wouldn’t you know it, one of the stones came loose somewhere between my room and the convention area. Despite a a period of angst-filled searching, my luck had run out: I never found that missing red stone. 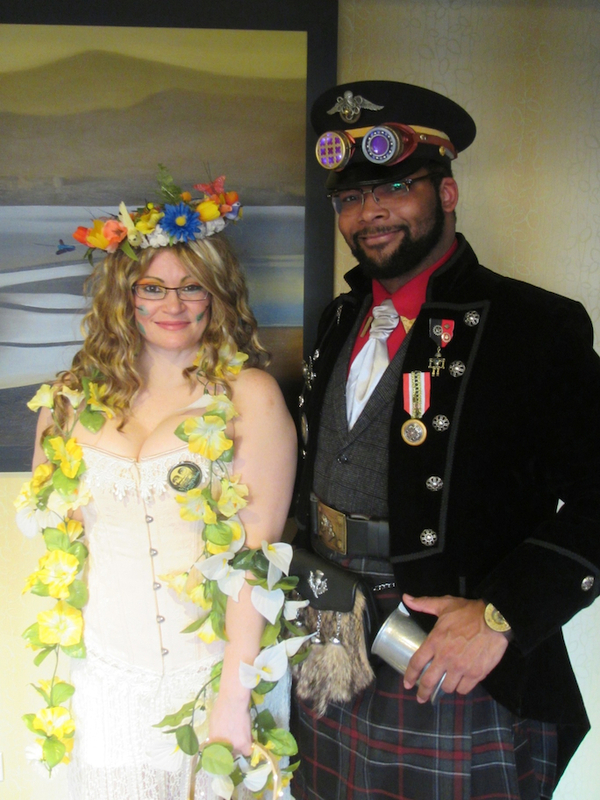 The main thing to do at a Steampunk event is people-watch, and there was plenty of eye candy to go around. Steampunks go all out in their attire, and just watching the parade of ladies and their dandies go by is worth the price of admission all by itself. 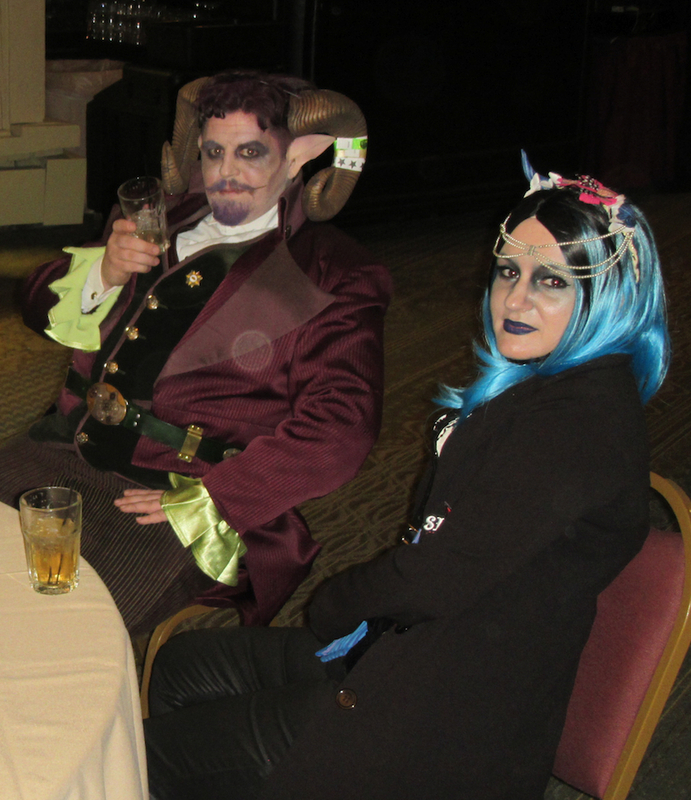 Even if you don’t have any steampunk garb to wear, the vendors can help get you dressed in some quasi-Victorian finery, so don’t let lack of an outfit stop you from attending a steampunk event near you. Geneva Steam is a fun weekend, and I’m already looking forward to next year. The theme for 2018 will be ‘Heroes & Villains’: I’m expecting to see many steampunked superhero outfits that have been sampled previously. Perhaps refurbished, tidied up, or even just straight out of the closet, I’m already excited to see what people come up with. Next year I swear, I’m going to take more pictures.